LP Chairman Launches "Liberal Information Campaign 2004"
"Liberal Party: Tradition, Action, Conviction" - a multimedia production and educational tool that showcases the Party's achievements in the last 58 years and explains why the LP is looking forward to a more promising future. "Electoral Campaign Management: A manual on vote-getting and vote-protection strategies" - This booklet was designed to address the needs of Liberal candidates throughout the country and contains useful strategies of how best to establish a campaign team, package messages, wine votes and - very crucial - protect these votes. The special elections issue of the quarterly Liberal Philippines magazine with a series of original reports and commentaries dealing with issues relevant to the LP's ongoing electoral campaign in the run-up to the May 10 elections. Keynote speaker at the media event was Senate President and Chairman of the Liberal Party (LP) Franklin Drilon, who said that the launching of the publications marks "a significant event in the history of the Liberal Party". The Party chairman emphasized the importance of political communication in a democracy and announced the imminent creation of a Liberal Party Media Bureau. 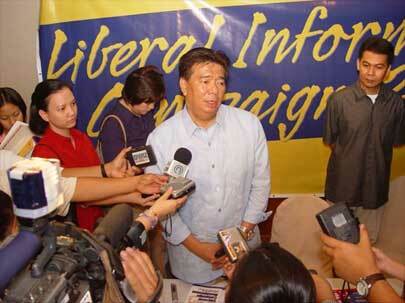 "Let us bring the Liberal Party closer to our people using the popular media", Drilon said. While the multimedia production was developed by members of the editorial board of Liberal Philippines magazine, the campaign manual was published by the National Institute for Policy Studies (NIPS), the liberal think tank of the Philippines. Members of the staff of the Friedrich Naumann Foundation took an active role in the development of all three publications. "The liberal family of the Philippines has developed modern communications tools to convey the liberal messages to the citizens, and the Foundation is excited to be part of this important political process", said Dr. Ronald Meinardus, FNF-Resident Representative in Manila. The campaign manual and CD-ROM are given out free to members of the Liberal Party. Non-members may purchase the book at the price of PhP 100 and the CD-ROM at the price of PhP 50. For orders, please email liberal@philippines.fnst.org or call (632) 8403728-29.